Situated in Moranbah, this apartment building is within 1 mi (2 km) of Lions Park and Moranbah Golf Club. Rodeo Grounds is 2.2 mi (3.6 km) away. 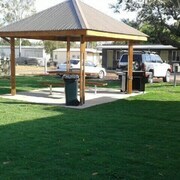 Situated in Moranbah, this motel is within a 15-minute walk of Lions Park and Moranbah Golf Club. Rodeo Grounds is 1.8 mi (2.9 km) away. 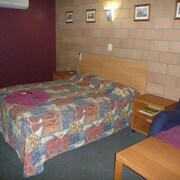 Situated in Moranbah, this motel is within 1 mi (2 km) of Lions Park and Moranbah Golf Club. Rodeo Grounds is 2.5 mi (4 km) away. 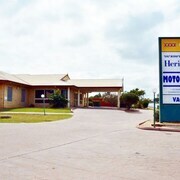 Situated in Moranbah, this motel is within 1 mi (2 km) of Lions Park and Moranbah Golf Club. Rodeo Grounds is 2.4 mi (3.8 km) away. Which hotels are closest to the Moranbah airport? Where to stay near top Moranbah attractions? 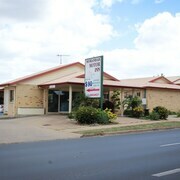 What kind of hotels are in Moranbah? 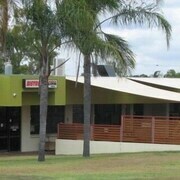 Which hotel chains are in Moranbah? Visitors can enjoy all that Moranbah has to offer including the golf courses, parks, and restaurants. This city's welcoming locals also attracts tourists. Favorite places to visit in the city include Rodeo Grounds, Lions Park, and Moranbah Golf Club. Additionally, you can explore the sights and enjoy the activities in the larger area. The Western Heritage Motor Inn - With a stay at this 4-star motel, guests can enjoy access to a restaurant and an outdoor pool, along with free WiFi. It's a favorite with Expedia travelers for its helpful staff and clean rooms. Oaks Moranbah - Amenities at this 4.5-star apartment include free parking and an in-room kitchen. 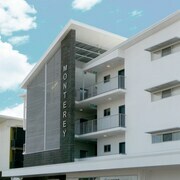 Direct Hotels - Monterey Moranbah - This 4-star apartment features free WiFi, free parking, and laundry facilities. Are there hotels in cities near Moranbah? Explore Moranbah with Expedia.com.au’s Travel Guides to find the best flights, cars, holiday packages and more!